Happy Valentine's day! Today of all days, the day of love, I'm launching my newest e-course! As a personal style blogger, I get lots of questions about personal style, how to wear certain items, how to banish the self conscious bug that keeps you from dressing with confidence, and how to dress for your body shape, among many other questions. I love answering questions like that and I figured making an e-course all about personal style would be the perfect way to put everything in one place! 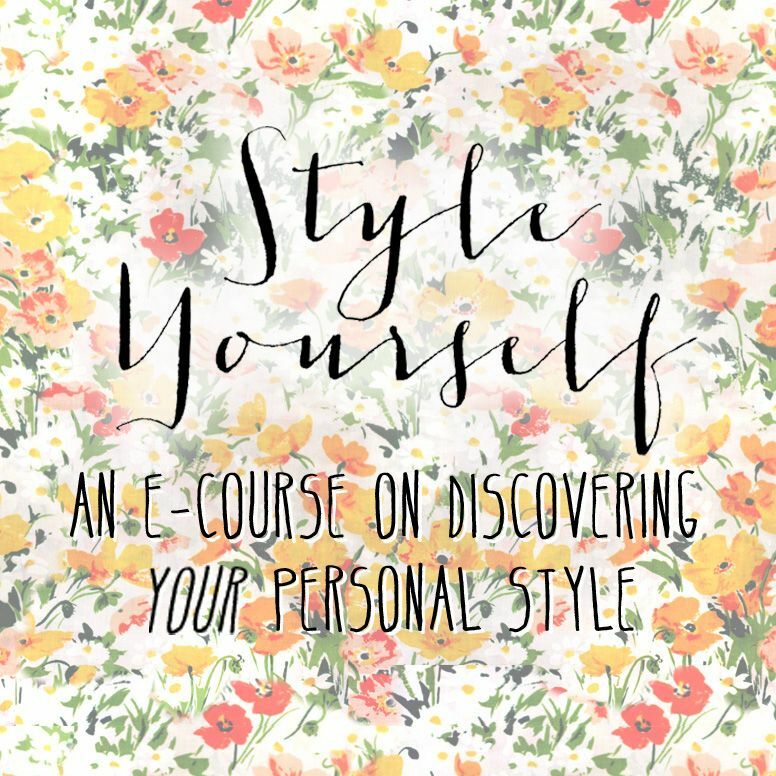 Style Yourself is an e-course all about discovering your personal style, learning how to express your amazing creative and beautiful personality through your clothing, and gaining the confidence to rock the styles you feel like you were born to wear. Discovering your own personal style is fun and exciting, though we all know how frustrating it can be when you're in the dressing room or standing in front of your closet and nothing seems "you." It's not always easy, and can take a lot of trial and error trying to figure out what style makes you feel the most and best you. Hopefully this e-course will help with that process! In addition to the e-course, if you sign up in the first two weeks, you'll have the opportunity to enter a giveaway with over $400 total in prizes from Emerging Thoughts, Ruche, Lulu's, Blowfish, ModCloth, Minnetonka, Radiant Cosmetics, Spotted Moth, & Lace Affair. Nine lucky e-course students will win prizes including gift cards and merchandise from those sponsors! So not only will you jump start your personal style, you'll have the opportunity to win prizes that will let you go out and buy new clothes which match your personal style! The giveaway is open to anyone who signs up in the first two weeks of launch, so if you sign up before February 28th, you'll be able to login to the e-course and enter to win! I believe that style is something totally unique and individual, and much more than just what's trendy or walking down the runways that season. Style is about expressing something about yourself through the medium of clothing. Whether we like it or not, our clothing says something about us. We assess things and people around us based on appearance, even though most of us try not to "judge a book by it's cover." When I get dressed in the morning, I feel like it's an opportunity to say something, visually, about who I am to the world around me. And depending on the day, that could be something totally different from yesterday! The beauty of style is that you aren't limited to just one style, though fashion magazines sometimes give the opposite impression. I can wear a vintage 1950's dress one day, and a body-con dress the next! There are no rules. Many of us were taught "fashion rules" as kids. Don't wear black and brown together, don't mix prints, no wearing white after labor day, etc. etc. This e-course is about throwing the rulebook out and starting from scratch– starting from YOU. Personal style is something that should emanate from within. Your passion and personality should dictate your personal style! In this e-course I'll cover topics including wardrobe basics, finding your style inspiration, dressing for hot/cold weather, layering, mixing prints, and tons of other fun stuff! Let's go! Any questions? Don't hesitate to email me! e-course giveaway will be open until 2/28 at 11:59 pm and can be accessed to enter on the front page of the e-course. all sales on e-courses are final and non-refundable. This giveaway is a work at your own pace giveaway and can be started at any time and worked through as fast or slow as you like. The e-course will be accessible for at least 1 year after you've signed up. You will be emailed your username and password to access the e-course within 24 hours of purchase.